NEXT Future Transportation Inc. (“NEXT”), a leading robotic vehicle company has introduced its Smart Airport Solutions in response to calls for greater convenience, as well as improved operational efficiency and profitability for the industry. SAN JOSE, Calif. /California Newswire/ — NEXT Future Transportation Inc. (“NEXT”), a leading robotic vehicle company introduced its Smart Airport Solutions in response to calls for greater convenience, as well as improved operational efficiency and profitability for the industry. With mounting operational pressures, airports face multiple challenges such as complex safety issues, limited operational resources, and low passenger satisfaction. Consequently, the contradiction between the rapid growth of air transportation volume and insufficient operational support capabilities is prominent. Improving passenger flow is a crucial area of focus as it means that airports can handle increasing traffic without sacrificing passenger experience. NEXT’s solution offers air travelers the convenience of completing a majority of the check in process during their commute to the airport. The solution is based on NEXT’s patented modular vehicle platform, which allows individual pods to connect in motion and form a fleet. Once pods are connected, the internal space of the fleet is utilized similar to a buses or rail. While en route, various security technologies are applied in combination to ensure a layered approach to security. NEXT’s passenger authentication solution utilizes artificial intelligence, biometric and facial recognition to accelerate the check in process. 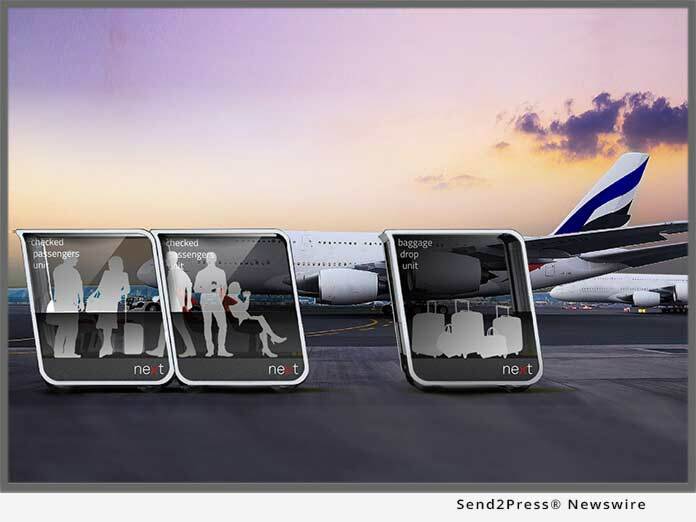 A comprehensive range of detection systems screen passengers and their baggage. “NEXT’s new solution provides airports with an innovative platform to enhance the passenger experience. Airlines will value the simplified processes, reduced costs and increased customer satisfaction, while airports will profit from the improved use of existing infrastructure and better service,” said Emmanuele Spera, CEO of NEXT. With most airports serving as multi-modal transportation hubs for passengers and trade, the current challenge is to transform existing systems and processes to become more intelligent, interconnected and simple to use for all stakeholders. As part of NEXT’s airport solution, its integrated data collection process will offer aviation stakeholders far greater insights into capacity planning, crowd-modeling, real-time staff requirements and security needs. “We designed a frictionless door-to-airport passenger experience with the ambition to build a modular, human-centric, and environmentally-friendly solution based on the notion of processing travelers in a contactless manner. Delivering travelers fully credentialed to the airport helps remove the tension between passengers and airlines,” said Tommaso Gecchelin, CTO of NEXT. NEXT’s new solution will become an essential marketing and promotional platform for airports. “The growing inclination of personalized passenger services is generating abundant opportunities for partnerships. NEXT is focused on collaborating with aviation stakeholders who are exceptionally committed to being at the forefront of the industry,” said Sven Hackmann, EVP of NEXT. NEXT Future Transportation, Inc. is a mass transportation and goods movement startup that is developing a patented modular, autonomous, electric vehicle fleet and the supporting operating system required to bring the systems and services to market at scale. Learn more: http://www.next-future-mobility.com/.